Pure Sound is a relative newcomer in the hi-fi market. It launched in the UK this year with a single integrated valve amp, the A30, which received widespread acclaim in the press. But now the company has just released details of two new products - an upmarket integrated amp and a matching phono stage. Called the 2A3, the new £1,700 amp is based around two 2A3 power valves per channel (hence the moniker) which help deliver 18-watts per side. 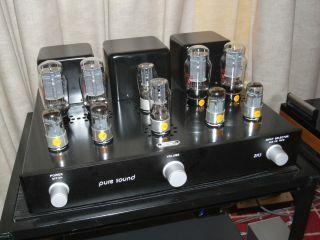 The special 2A3 valves - much revered by Pure Sound - are in production again, much to the delight of the company. It stated: "For many, the simple circuits that can be built around such devices better preserve the structure, colour and feeling within the music". The amp's use of the 2A3 valve harks back to the earliest audio amplifiers, yet Pure has brought this ageing technology back into the modern day with a cleverly designed choke-loaded circuit, which is said to enable maximum performance from the 2A3. Further key features include a high-quality ALPS volume control and a careful selection of audiophile-grade circuit components. The second product, the new P10 phono stage (£400), is a triode-based device with a clever power supply, that's compatible with both Moving Magnet (MM) and high-output Moving Coil (MC) cartridges.